Two compounds have red markings and two compounds have white markings - it'll be easy to tell the difference when they're standing still, but when they're moving...? Pirelli has made the tyre situation for 2019 a little bit less confusing. Instead of seven different dry weather compounds, four of which had the word ‘soft’ in the title, this season there will be just five compounds. They won’t have names either - the hardest will be called C1, followed by C2, C3, C4 and the softest is the C5. Thankfully, we won’t have to hear commentators say things like ‘Sergio Perez has made his C3s last an awfully long time!’ and wonder why Martin Brundle is praising a driver’s ability to keep a small Citroen running. That’s because three compounds available at each race will simply be called hard (white rim), medium (yellow), and soft (red). Easy, right? The problem is that in testing, all five compounds will be available to use. 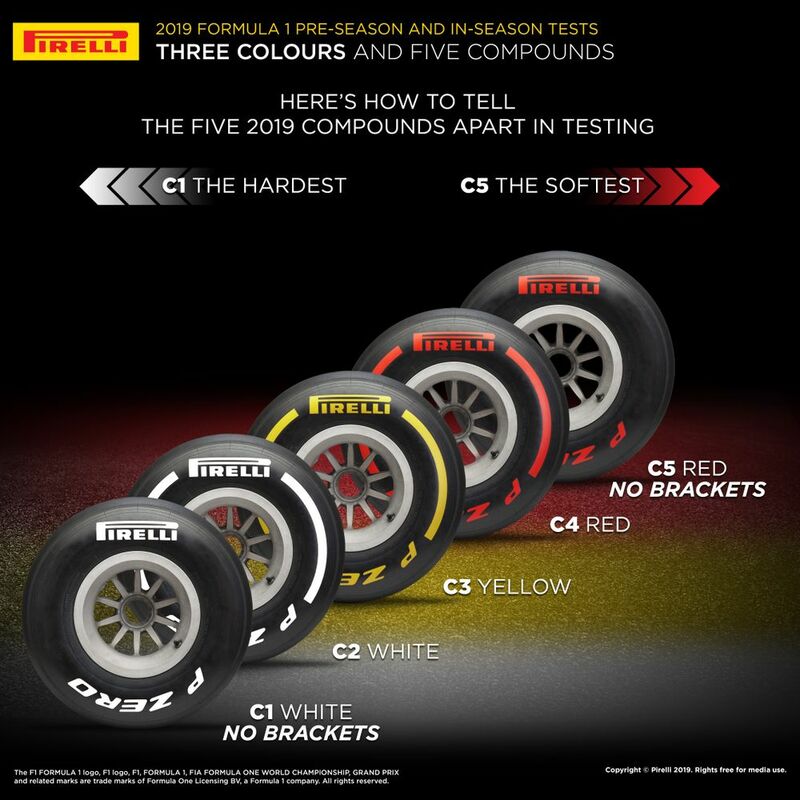 But instead of simply adding a couple of extra colours for the hardest and softest tyres in the race, Pirelli has added a new system of tyre markings. See the problem? Pirelli motorsport director Mario Isola said this has been done to “make sure that people can tell the compounds apart.” And sure, it’s easy enough to tell them apart from an image, but when the tyres are doing what they usually do - you know, rotating - being able to tell which red or white tyre does or doesn’t have brackets is going to really difficult, isn’t it? The reliance on who’s running what is going to be down to eagle-eyed people in the pit lane, sharp photographers or the honesty of the teams. Actually, that could kind of be a good thing. Imagine if Mercedes sets a lap on the softest tyres, which is then beaten by a Red Bull which is on red-walled tyres, but nobody knows which type. It could bring about a bit of intrigue as to which team is performing well on which tyres. Then again, it’s testing. Nobody really knows what teams are doing anyway and even if anyone does have a vague idea, it’s never really accurate anyway!